Solacom is proud to work with companies worldwide to deliver industry-first critical communications solutions to customers. Whether your company is a value added reseller, system integrator, or distributor, Solacom’s Partner Portal provides you with easy, secure access to product information, sales tools, training and more – everything required to grow your business in partnership with us. Before registering for access to the Partner Portal, your company must have completed the Channel Partner Application and be a registered Channel Partner with Solacom. Access to the Partner Portal will not be granted until this process is completed. If you are unsure as to whether your company is a registered Channel Partner, please contact your Solacom Account Representative for further assistance. 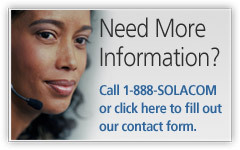 Solacom reserves the right to alter the content and/or format of the portal at any time without prior notification. Use of the information within this portal is strictly limited for use by registered Solacom Channel Partners only and is subject to all conditions identified on the Solacom Website Terms and Conditions page. The content on this portal contains valuable trade secrets and proprietary information belonging to Solacom Technologies. The content is confidential and is intended solely for authorized customers and partners. No part of the content may be reproduced, stored in a retrieval system, or transmitted in any form or by any means without prior written permission from Solacom.